Starting this Diwali on a Sweet Note: Enjoy each day and Make it Worthy! 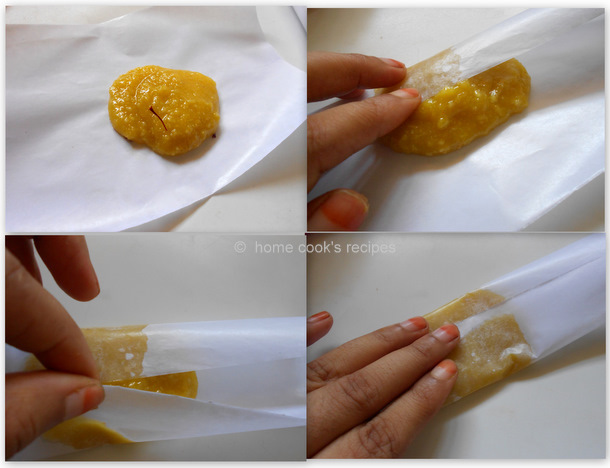 I love the wrapping part very much, it makes kids go crazy over the halwa. As a kid, I used to assist my grand father and grand mom in wrapping up these halwa. My son loved very much like his mom. Coming to the halwa, you need to be very care full at two points. one is at sugar string consistency and the other one is to check whether the halwa is done or not. I have given my observations to help you. do let me know if you have any other points to look for. Boil a cup of water, add badam to it, let it boil for 2 mins. If the badam is aged, it floats on top, therefore you can proceed to peel its skin. If the badam don’t float, it means they are new, so you have to give soaking time for badams from 1-2hrs. After 2 hrs rub their skin off. First Grind the cashews into a coarse powder, remove the grounded into a bowl and set aside. Secondly, Grind the soaked and skinned badam into a coarse paste with little water(about 6 tbsp’s). The coarse paste should be like the one as grainy as shown in the pic above. I prefer halwa to be grainy than so smooth. this gives a nice texture to the halwa. 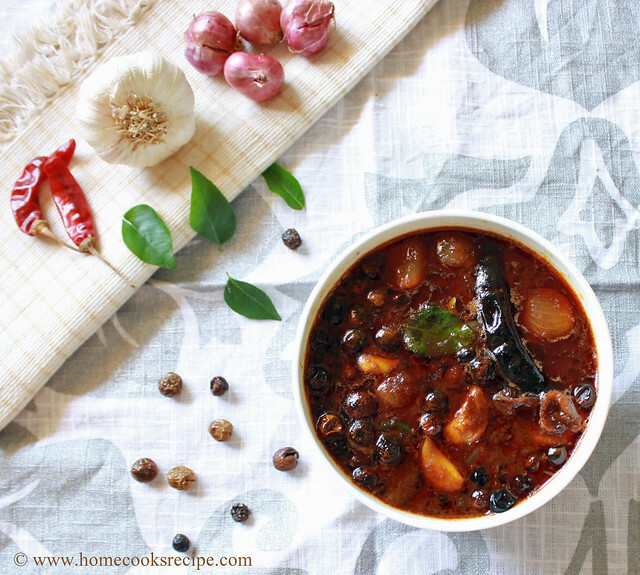 Now heat a thick bottomed kadaai, add ¾ sugar. ¾ water so that the sugar immerses in water. Make sugar syrup till it reaches single string consistency. How to check single string consistency? Once the Sugar Syrup starts boiling, switch over to medium flame, keep on checking the syrup every 30 seconds. It may take from 3-5 minutes in medium low flame to attain the single string consistency. Swipe a little syrup with your pointing finger, rub it with thumb and stretch the two fingers slowly, you will get a single string. Once the Sugar Syrup reaches single string consistency, add the grounded badam and cashew to the syrup and mix well with a slotted spoon. Make sure you break the lumps formed. Keep stirring the halwa in medium flame for about 5 -7 minutes. In Between, the halwa gets thicker and starts sticking to the kadaai. 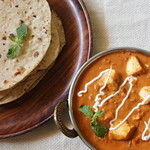 At this stage, you can start adding ghee 1 tbsp at a time in 1 minute intervals. 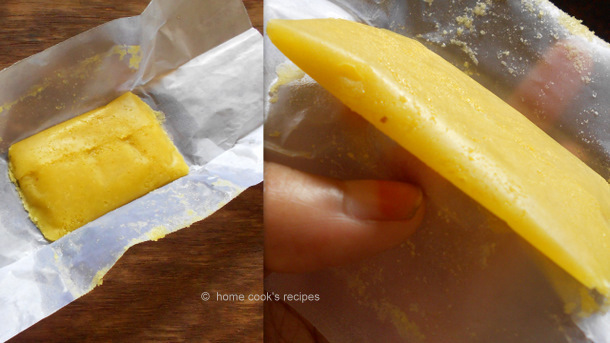 Slowly the halwa stops sticking to the kadaai and when ghee is added, halwa absorbs the ghee little later. 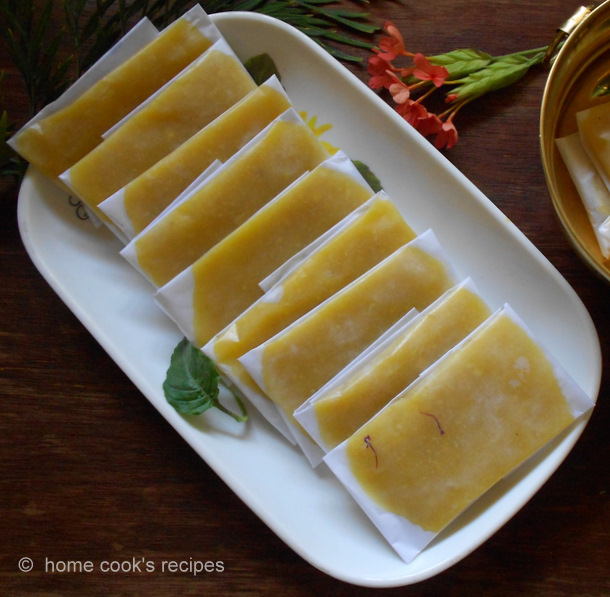 Add lemon yellow food colour and saffron strands to the halwa and mix well. How to test whether halwa is done or not? Take a small pinch of halwa with your fingers. You should be able to shape the halwa into a small ball without sticking. Once the halwa is done, remove to a bowl. Cut the Butter Paper by 20 cm X 10 cm. place halwa in between, fold all sides. Since no milk is added in halwa, this keeps well for 4-5 days. store the halwa in room temperature. 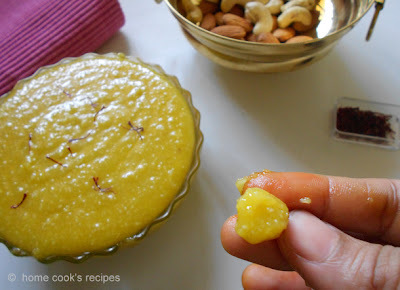 Hope you all enjoyed my Badam halwa, guess it was a virtual treat for all, Try it out and enjoy my most loved dessert. Thank You Ammumma!! I wish i could have done better! Lavi, kalakkiteenga. Supera irukku. Esp the folded halwa,wow! Wow supera iruku Lavi, apdiye kadaila irukara mari...the wrapped ones looks so professional..lovely clicks!! 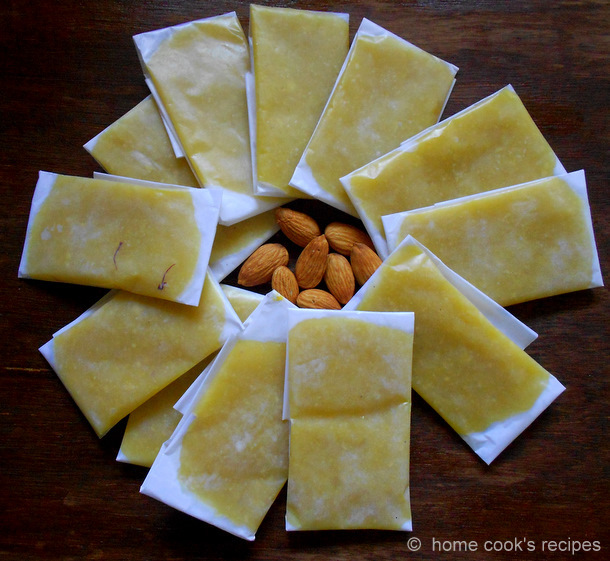 Wow, superb badam halwa, in fact I read word to word at what u wrote :):) Thanks for the illustrative clicks. thats awesome and love how you presented this folded in butter papers. very unique. wow looks extremely professional. nice presentation too. Wat an incredible presentation, super delicious halwa, well done Lavanya.. Very impressive step-by-step recipe dear.Badham Halwa luks colourful and yumm.Luv it. 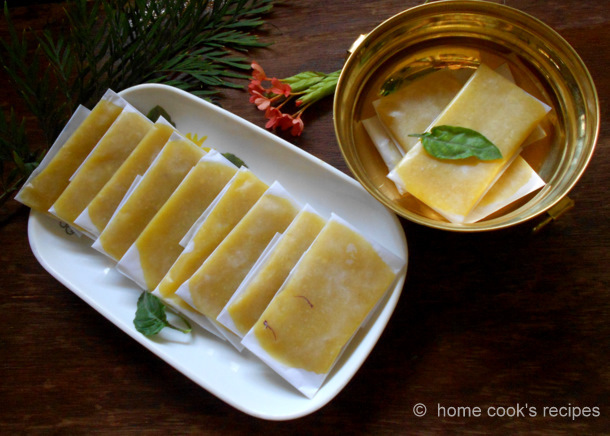 Looks just like the badam halwa that is served during weddings. 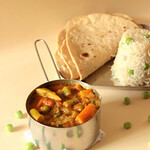 super recipe...lovely clicks nd presentation. looks so nice and perfect. I came across through facebook. One of my fav. Nice step by step instructions. Looks really tempting and yummy. perfect awesome .. the packing is perfect n tats the right way.. i remember my childhood days my grand pa gets me these every day back from work..
hi the pics are lovely.Feast to the eyes.I am going to try this for diwali. I have a small doubt,can we use ground almonds(powder) that we get from shops instead of almonds. I really appreciate ur reply.Thank you. No you cant use almond powder for this recipe, as the recipe wants almonds grounded with little water, moisture from water is important! Do let me know, how it turned out! I tried badam halwa and it turned out very nice. The taste was very nice.But i did not get the texture as yours.Next day,it was like burfi texture.And the taste was better. Thanks for trying out and letting me know about it. iam happy for that! 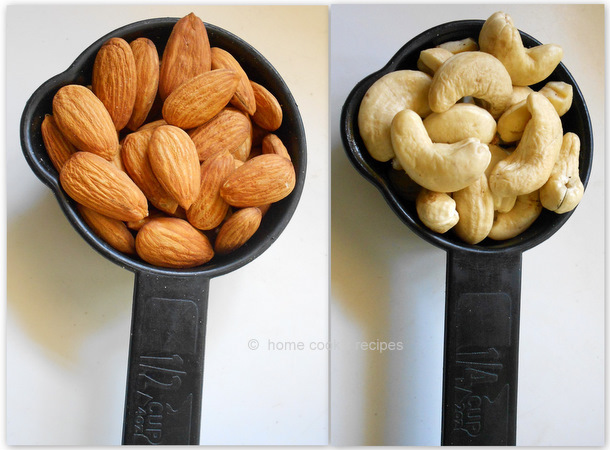 texture depends on how coarse or finely we grind the badam and cashews. also you should remove the halwa from the flame at right time, when you see halwa leaving the sides of the pan and stop sticking to the pan, pinch a small bit of halwa and roll with your fingers, it should not be sticky and good enough to roll into a small ball shaped one. yes the next day, halwa turned into burfi like one for me too, you can check in my pictures also. it is because the ghee solidifies at room temp. you can re-heat in microwave for 20 seconds. even i dont want the halwa turn into burfi, if i or you got the trick, will update here.. I think i might have cooked it too long,it all changed in fraction of time. A small tip,At one stage the halwa was splattering all over the place,it was very difficult to mix.so i used oven gloves while mixing the halwa.Hope this helps. Thanks again for posting such a delicious recipe. 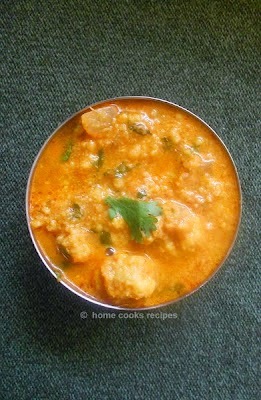 i tried this recipe.. but after adding the 4th tbsp of ghee it resembled like biscuit powder.. i continued adding the rest of the ghee but final product texture was that of biscit powder.. i used non stick pan.. can u pls help what must be the reason.. where did i go wrong..is it bcoz igrounded almonds too coarse..
Neat n clear explanation!yes,its a visual treat indeed!